It was after 11 when Dallas and I finally woke up. We had been hoping to leave by noon and catch the last ferry to Ocracoke Island at 5:30pm, but I needed to get somewhere with wifi to wire money to the realtor of the place we’re going to live in Newport. Noon came and went, and we still hadn’t left Beaufort, so we decided to hang out in the town for a little longer since we were probably going to miss the 5:30 ferry. 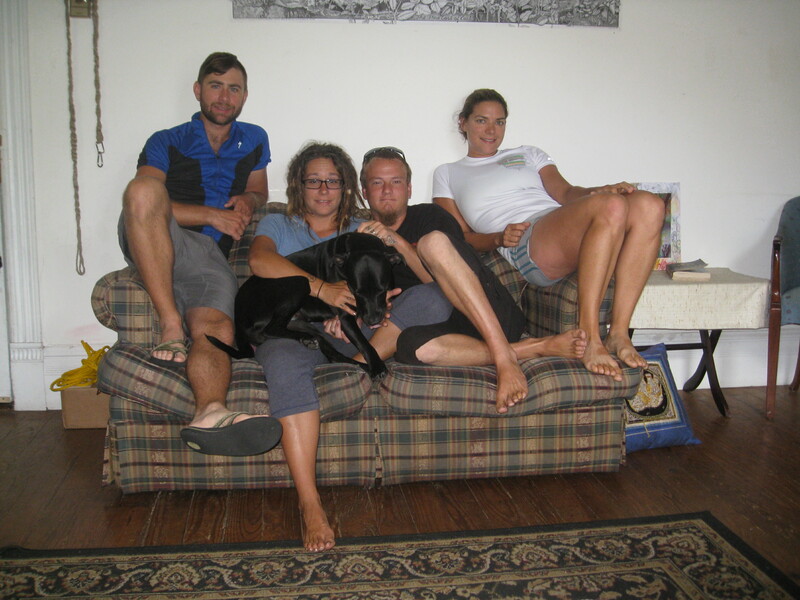 We’d still leave Beaufort that day but just camp on Cedar Island overnight and catch the first ferry in the morning. There really wasn’t anything else in between Beaufort and Cedar Island, so we figured it was better to spend our time in town rather than get to Cedar Island early and have nothing to do for the rest of the day. 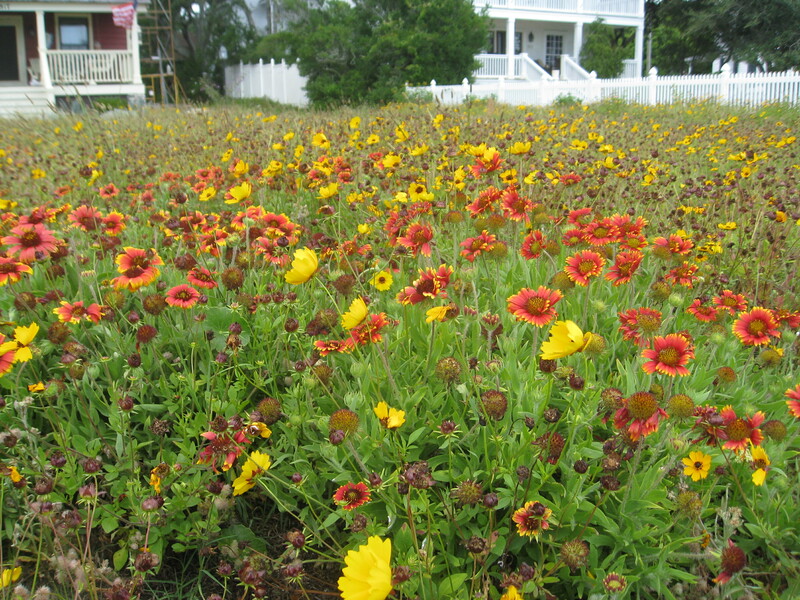 Many of the homes in Beaufort have lawns of wildflowers – much nicer than grass lawns, and less maintenance required! Our first stop after breakfast was the laundromat, and we walked around Beaufort while our clothes washed and dried. Beaufort is a charming port town, with plenty of ice-cream shops, chocolate, coffee, art, sailboats, and nice homes with large front porches. One of the houses, the Hammock House, was where the pirate Blackbeard lived. When we were finally ready to leave Beaufort, we made one last stop to split a sandwich and some ice-cream, since we were hungry again. While standing outside with our bikes, a family walked by, and the father, Bill, started talking to us about our trip. He gave Dallas his card before they continued on their way. Not five minutes later, after we had gone in to fill our water bottles, Bill came inside and handed Dallas some money! People never cease to amaze me with their generosity – we are very thankful. We finally hit the road at 5:30pm and were met with strong headwinds. For 19 miles we struggled to move forward against the wind before stopping at a gas station to refill on water. We had left rather late, and we were making slow progress. The sun would be down in an hour, and we didn’t want to get caught in the dark without a place to camp. We settled on camping 6 or 7 miles later, under a tall electrical tower, in a town called Stacy. As soon as we stopped we were swarmed by mosquitoes and biting flies. Both Dallas and I slathered ourselves with this natural insect repellent that we had bought from the organic market in Jacksonville, but we were still being bitten. We had to make a decision quickly or else we’d be stuck in the dark, so we set up our tent on the flattest and driest patch of ground we could find. This happened to be over a bunch of broken shells, which were awfully uncomfortable to lie on. Poor Dallas was really reacting to the mosquito bites. He already had welts all over his legs from the previous days, and now they were attacking him relentlessly. He was reluctant to go back outside to cover his bike once we were safe inside the tent, so when it started to pour, I ran out and covered our bikes. I think Dallas spent a fair amount of time reading about mosquitoes and the diseases they can carry on his iPhone while I tried to fall asleep. It was not a very restful night. 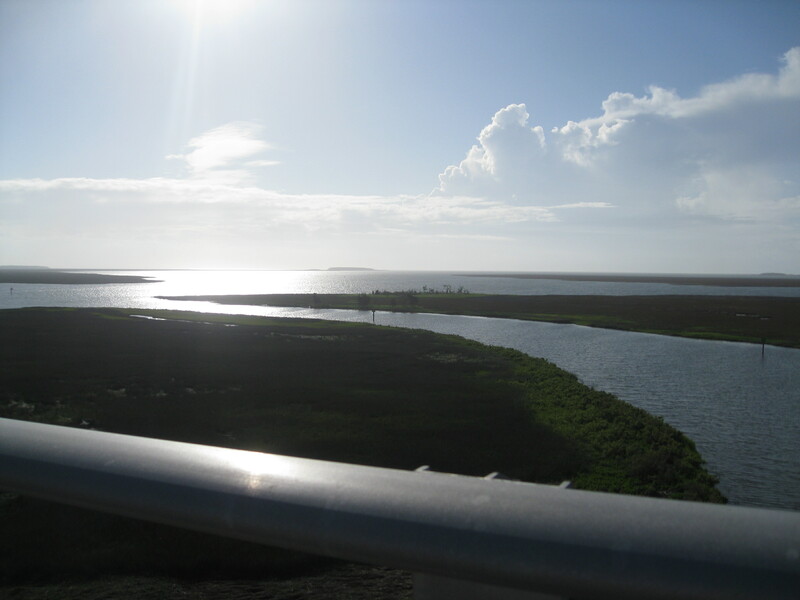 It was another 14 miles to the Cedar Island Ferry, and Dallas and I rode there nonstop, aside from a pause to take a photo from the bridge over the Cedar Island National Wildlife Refuge. We didn’t make the first ferry, which left at 7am, but we purchased tickets for the next one that left at 10am before going into the motel for a free continental breakfast. We had about an hour to spare before lining up with the motorcycles waiting to get onto the ferry. We had to wait for the long line of cars, including two enormous RV’s (one of which was pulling another car on a hitch) to board the ferry before we were allowed on. I cannot believe all of them fit on such a small boat! 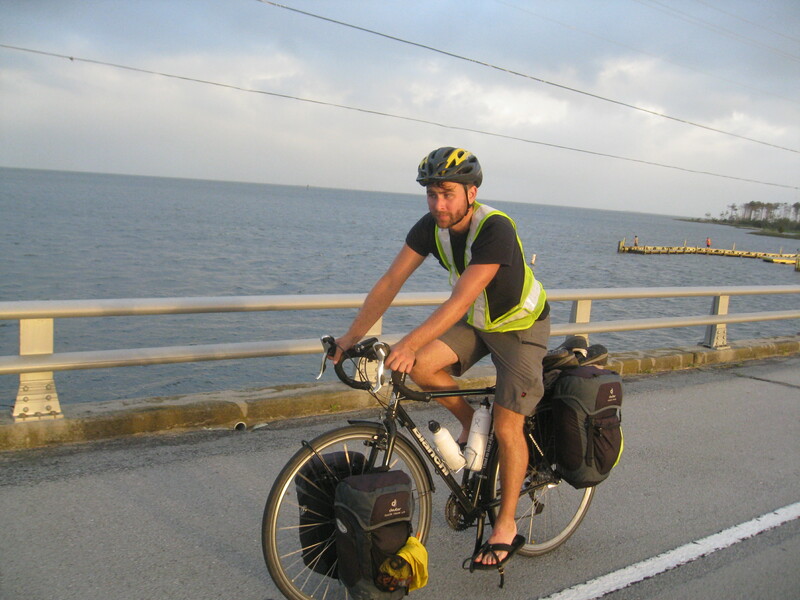 Posted on 27 May 2012, in Bicycle Touring, New Orleans to Newport. Bookmark the permalink. Leave a comment.